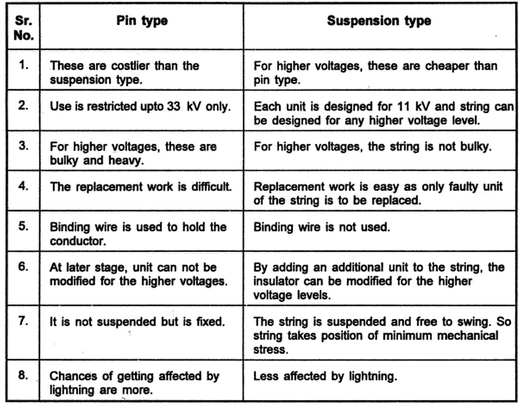 As the voltage level increases, pin type insulators become very bulky and their cost also increases rapidly. Hence the most popular insulators used for very high voltage transmission lines are suspension type insulators. These insulators have number of porcelain disc units. These units are connected to one another in series with the help of metal links. This forms a string of porcelain discs. 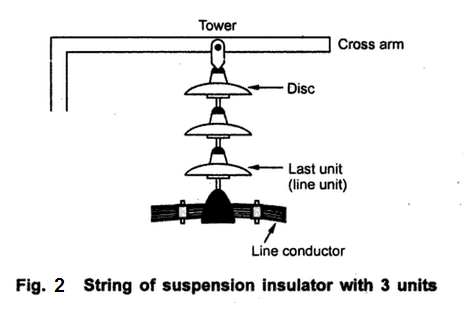 The top most insulator unit is connected to the cross arm of the tower while the lowest insulator is made to hold the conductor along the conductor shoe. Each unit is designed for the low voltage for say 11 kv but a string of such units give us the proper insulation against very high voltage levels. 2. Hewlett or inter-linking type. The cemented cap type is the most commonly used suspension type insulator. The Fig. 1 shows the cemented cap type suspension insulator. It consists of a single disc shaped piece of porcelain. At the bottom, it is grooved so as to increase the flash over distance. A galvanised cast iron cap is cemented at the top. The space is provided in the cap, which can be used to hold the pin of another unit. The cap is cemented to the insulator. And the pin is either cemented or connected by means of steel wire spring ring. The main drawback of this type is that the cubical expansions of three material iron, porcelain and cement are different from each other and due to this fine cracks in the insulator and early failure is possible. The Hewlett type insulator is more simple in design. It consists of a porcelain disc. The top portion of the disc consists of two curved tunnels, the planes of which are at right angles to each other. Lead covered steel U links are passed through the tunnels. These links are bolted to the two similar units at the top and bottom. No cementing is required in this type of insulator. The mechanical strength of this type is also very high due to the use of steel links. Another advantage of this type is that even if porcelain breaks due to the links, the units are held together and there is no interruption in the working. But the main disadvantages of this type is that the porcelain in between is under high electrostatic stress and hence there is possibility of puncture earlier than the cemented cap type. Hence cemented cap type is more preferred than Hewlett type. 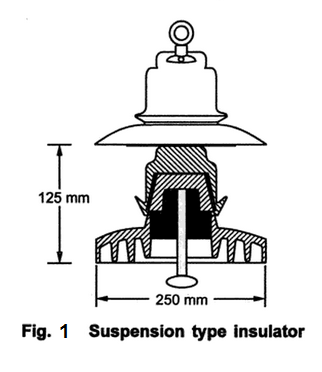 The overall string of suspension type insulators is shown in the Fig 2. The top unit is fastened to the cross arm of the tower. The lowest unit holds the line conductor. This bottom most unit, which is nearest to the line conductor is also called line unit. 1. For higher voltages, these are cheaper than the pin insulator. 2. Each unit is designed for low voltage level such as 11 kv but by connecting such units in series to form a string, insulator for any higher voltage level can be designed. 3. In case of failure of any of the units, the replacement work can be done very easily and entire string need not be replaced. 4. If the line voltage is required to be increased at some later stage to satisfy increased load demand then just by adding additional units to the string, same insulator can be used. Adding such units is very easy. 5. This type of insulator provides greater flexibility to the line. The string is suspended and is free to swing in any direction. So it takes the position so that mechanical stresses on the line are minimum. 6. When used with the steel towers, the line conductor are less affected by lightning. This is because the conductor is lower than the earthed cross arm and the arrangement acts as a lightning arrester.